Our daughter was in NICU for about three weeks. 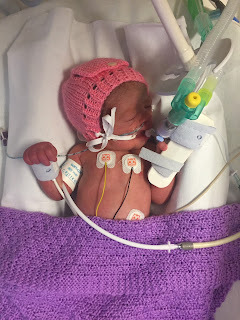 NICU is a lonely place with only the medical staff as your friends, especially when like us, you’re transferred to a hospital miles away from home. You walk those corridors leading up to your baby’s bed, and walk into a room full of antibacterial hand wash, blue lights and beeping machines, helping poorly babies get better. The smell is bleachy clean. I couldn’t even see my daughter’s face properly because of all the wires. It’s a heartbreaking and frightening sight. You’re not quite sure what you are and aren’t allowed to do. Which is a weird feeling as it’s your baby and you’re the parent. 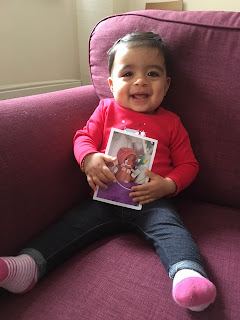 I remember waking up every morning and at times wanting to rush over to my daughter’s bedside to see how she’d been during the night, or not rushing at all because I was so scared something awful may have happened. I underestimated her strength and mine. I was adamant I wanted to breastfeed. But after my c-section and the stress of a NICU baby, my milk didn’t come in. I sat trying to express 8-10 times a day, but 10ml was all I could produce at times and I nearly gave up. My baby couldn’t handle formula, it was too heavy for her. So in stepped a nurse who gave me a pep talk and persuaded me to drop my shoulders, relax and keep trying. I remember a phone call to my Mum about four days into our stay. She was upset she was so far away and couldn’t help me. I recall crying down the phone saying, “She’s my daughter and I don’t know how to help her.” Those words haunted me for ages. Becoming a Mum was totally different to how I’d dreamt it would be. I remember going out for a walk one lunch time. The hospital wasn’t anywhere central, so I just walked around the car park several times. The weather was damp, misty and horribly grey. It’s funny how you remember some things in great detail, but other things you don’t. When you become a parent all you want to do is protect your child. But this protection increases by a hundred when you have a premature baby. You take the comments on size and weight personally. As a new Mum you feel like you’ve failed somehow before you’ve even started your job as a parent. After 5 days Aarya came off all the machines you become familiar with. Ventilators, C-Pap, lumber punctures and so on are terminology you become experts in. We came back to our birth hospital and in total Aarya spent nearly 3 weeks in NICU. She was allowed home at 37 Weeks once she’d gained her birth weight and I was exclusively breast feeding. Three weeks before her due date, we finally started our life as a family of three where we’ve all gone from strength to strength. I won’t lie, a few months post partum it all finally got to me and hit me hard. I was diagnosed with post traumatic stress disorder and it took a while to get my head around everything that had happened to us. A year on, I still get very tearful about everything. I call my c-section scar ‘my battle wound’. I fought, I fought hard for my daughter, for me and my little family. As a parent of a premature baby, you find a strength in you to fight the battles you are faced with during those difficult weeks and months.